Michael Anthony is pumped about Chickenfoot's upcoming second album. Can't you tell? 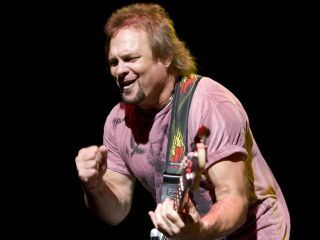 When bassist Michael Anthony got together with his Chickenfoot bandmates (vocalist Sammy Hagar, guitarist Joe Satriani and drummer Chad Smith) in the studio last February, he admits that he thought the group was still in rehearsal mode. Before he knew it, however, they were recording their second album - for real. "At first, I was a little thrown," he tells MusicRadar. "We were still writing and completing songs. A lot of things weren't fully worked out. But the spontaneity was there, and the chemistry between the four of us was so strong - why would we want to put a stop to that? It was like, 'OK, push the buttons and let's roll!'" Chickenfoot tracked the record at Hagar's warehouse studio, affectionately dubbed 'The Foot Locker,' with veteran engineer Mike Fraser serving in that capacity and co-producing with the group. "I've worked with Mike before and can't say enough good things about him," says Anthony. "The sounds he gets are so great, so I decided that I should have a lot of bass options available to me. "I brought a bunch of basses and four different amps with me," he continues. "I even had an amp built for me. When I was jamming and working on stuff with Chad, there was a guy at the studio who was making reissues of these old amps called Versatones. I never even heard of them before, but I checked one out and it sounded great. 'OK, I want one,' I said." The amp set Anthony back $3,000 - a hefty sum, especially considering the fact that he didn't even use it on the album. "We started recording, and it turned out that the best combination for me was the same bass and amp I used on the first album. Everything else, including the Versatone, just sat there." Anthony returned to using his Ampeg Rocket B50-R, with no regrets. "It's a little amp with just one 15-inch speaker, but it gets a killer sound, better than anything else I've tried," he enthuses. As for his bass, Anthony's trusty Yamaha Rat Rod bass, created by the Yamaha Custom Shop, did the job beautifully. "It was kind of cool, actually. One bass, one amp - perfect. Not having to worry about changing my rig around for every song allowed me to concentrate on other things." Such as background vocals, which Anthony says are featured more prominently on the new disc than on Chickenfoot's debut. "For some reason, my voice doesn't age," he says. "I can still hit those high harmonies just like I did back in the day." Laughing, he adds, "My wife likes to say I act like a kid, so maybe that's why I sing like one!" On a serious note, Anthony does cite one major factor for contributing to his increased vocal power: he gave up smoking. "I was never a real smoker," he stresses. "I don't think I've ever smoked an entire cigarette from start to finish. But for years and years, if I was out with people, having cocktails or dinner or whatever, and if somebody was smoking, I'd take a few drags off their cigarette. It was stupid, but that's what I did. "Recently, though, I said to myself, 'Why am I doing this?' So I just stopped messing around with cigarettes, just cut 'em out entirely. For one thing, I want to live a long life and try to grow old gracefully, so that's a good reason to quit. But I found that my singing improved dramatically. I've always been a natural singer on stage and in the studio - never had a vocal lesson in my life. But by trying to take better care of my voice, I can really feel and hear the difference. I'm pretty proud of my singing on this new album."